The ankle joint is a hinged synovial joint with primarily up-and-down movement (plantarflexion and dorsiflexion). However, when the range of motion of the ankle and subtalar joints (talocalcaneal and talocalcaneonavicular) is taken together, the complex functions as a universal joint (see the image below). The combined movement in the dorsiflexion and plantarflexion directions is greater than 100°; bone-on-bone abutment beyond this range protects the anterior and posterior ankle capsular ligaments from injury. The anterior and posterior ankle capsular ligaments are relatively thin compared with the medial and lateral ankle ligaments. Type I collagen tissue constitutes the bulk of the capsule and supporting ligaments of the ankle joint. The fiber density and orientation are arranged dynamically according to the typical mechanical stress experienced by the joint. Within limits, the greater the excursion of the joint capsule and ligaments, the less likely sprains are to occur. With increased motion, the muscles absorb the mechanical force energy without exceeding the tensile limits of either the joint capsule or the ligaments. The subtalar joint is defined differently by various groups. The anatomic subtalar (talocalcaneal) joint refers structurally to the articulation between the talus and the underlying calcaneus. Orthopedic surgeons, however, refer to the functional subtalar joint as consisting of the anatomic subtalar joint plus the talocalcaneal part of the talocalcaneonavicular joint; it is not possible for the two joints to function independently. In addition to the general anatomy of the ankle, note the biomechanical function of each component in stabilizing the joint. In dorsiflexion, the ATFL is loose, and the CFL is taut. This is reversed in plantarflexion, in which the ATFL is taut and the CFL is loose. The PTFL is maximally stressed in dorsiflexion. The CFL is cordlike and is thicker and stronger than the ATFL, and it runs from the tip of the lateral malleolus to the lateral aspect of the calcaneus directly below the fibula. The CFL prevents adduction and acts virtually independently in neutral and in dorsiflexed positions. The ATFL has a lower load to failure than the CFL; that is, the maximum load to failure of the CFL is roughly 2-3.5 times greater than that for the ATFL. However, the ATFL can undergo the greatest amount of deformation (strain) before failure and allows for internal rotation of the talus during plantarflexion, in contrast to the CFL and PTFL. The ATFL primarily restricts internal rotation of the talus in the mortise; when in plantarflexion, the ATFL also inhibits adduction. The PTFL is the strongest of the three portions of the lateral ankle. It runs almost horizontally from the fossa in the inner aspect of the tip of the lateral malleolus to the posterior tubercle of the talus. The PTFL inhibits external rotation with the ankle in dorsiflexion. Note that medial ligaments are the primary restrictors of dorsiflexion (see the image below) and that the PTFL only assists in this function. The short fibers of the PTFL can also restrict internal rotation after rupture of the ATFL. After disruption of the CFL, the PTFL inhibits adduction with the ankle in dorsiflexion. 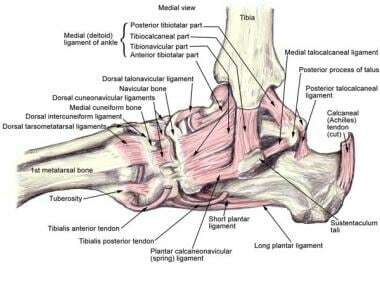 Medial ankle view showing the ligamentous anatomy of the deltoid ligament and related structures. The superficial deltoid ligament originates from an anterior bony prominence of the medial malleolus referred to clinically as the anterior colliculus. The tibionavicular portion inserts onto the navicular and is the most anterior part; the tibiocalcaneal portion begins at the anterior colliculus and inserts onto the sustentaculum tali; and the final component of the superficial deltoid is the posterior tibiotalar ligament (PTTL). The deep deltoid ligament originates from the intercollicular groove and a posterior bony prominence referred to clinically as the posterior colliculus. It is shorter and thicker than the superficial portion and is contiguous with the medial capsule of the ankle joint and the medial portion of the interosseous talocalcaneal ligament (IOL). The greatest mechanical forces across the ankle joint are directed medially in the normal external rotation of the foot in walking and running. This is reflected in the strength and thickness of the deltoid ligament. Biomechanically, the deltoid ligament primarily prevents abduction. After division of both components of the deltoid ligament, anterior instability of the ankle does not increase. Once the lateral ligaments are cut, the deltoid ligament acts as a secondary restraint against anterior translation. 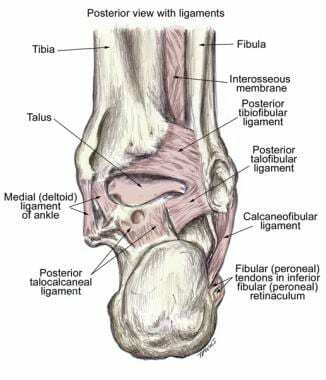 The fibular ligament primarily inhibits lateral translation of the talus. The deep deltoid ligament provides the greatest restraint against lateral translation. In order to tilt the talus in valgus within the mortise, the superficial and deep deltoid ligaments must be completely ruptured. Biomechanically, a certain amount of motion is allowed in all planes with respect to the distal ends of the tibia and fibula. When the ankle goes from full plantarflexion to full dorsiflexion, the distance between the lateral and medial malleoli increases by approximately 1.5 mm. Rotation of the tibia on the talus can also occur while a person is walking. This rotation can be as much as 6°. The AITF ligament provides approximately 35% of ankle stability; the deep PITF, 33%; the interosseous PITF, 22%; and the superficial PITF, 9%. Ogilvie-Harris et al experimentally demonstrated the importance of the syndesmotic ligaments to ankle stability by sectioning the ligaments. Rasmussen demonstrated that the ligaments of the syndesmosis play little role in the stability of the ankle as long as the other ligamentous structures are intact. No study exists in which a purely ligamentous injury to the syndesmosis has been produced through externally applied stress (ie, external rotation and abduction). The subtalar joint (talocalcaneal joint) can be divided into anterior and posterior articulations that are separated by the sinus tarsi and the tarsal canal (see the image below). The anterior subtalar joint (talonavicular) is formed by the anterior portion of the talus, the posterior surface of the navicular, the anterior part of the calcaneus, and the calcaneonavicular ligament and the fibrous capsule. The posterior talocalcaneal portion is formed by the posterior facet of the inferior surface of the talus and the corresponding posterior facet of the calcaneus. 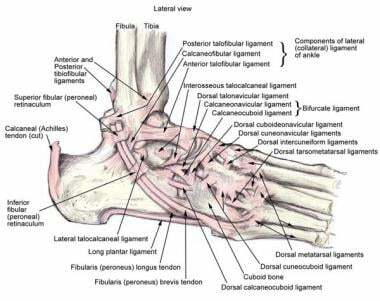 Posterior view of the ligaments of the ankle. The primary ligaments of the subtalar joint (talocalcaneal joint) are the calcaneofibular ligament (CFL), lateral talocalcaneal ligament (LTCL), cervical ligament (CL), and the interosseous talocalcaneal ligament (IOL). The CL is believed to be the strongest bond between the talus and the calcaneus. From a biomechanical standpoint, the motion of the subtalar joint (talocalcaneal joint) is flexion-supination-adduction or extension-pronation-abduction. The motion occurs via talar ovoid surfaces moving over calcaneal ovoid surfaces. These investigators' findings emphasize the importance of the CFL in providing lateral stability to the subtalar joint (talocalcaneal joint). This conclusion is contrary to that of a study by Cass et al that demonstrated no such influence on subtalar motion. The discrepancy among the studies may be explained by the variability of orientation of the CFL. When the CFL is injured in a type A or C anatomic variant, increased subtalar motion is expected. Attarian DE, McCrackin HJ, DeVito DP, McElhaney JH, Garrett WE Jr. Biomechanical characteristics of human ankle ligaments. Foot Ankle. 1985 Oct. 6(2):54-8. [Medline]. Ogilvie-Harris DJ, Reed SC, Hedman TP. Disruption of the ankle syndesmosis: biomechanical study of the ligamentous restraints. Arthroscopy. 1994 Oct. 10(5):558-60. [Medline]. Rasmussen O. Stability of the ankle joint. Analysis of the function and traumatology of the ankle ligaments. Acta Orthop Scand Suppl. 1985. 211:1-75. [Medline]. Harper MC. The lateral ligamentous support of the subtalar joint. Foot Ankle. 1991 Jun. 11(6):354-8. [Medline]. Kjaersgaard-Andersen P, Wethelund JO, Helmig P, Soballe K. Stabilizing effect of the tibiocalcaneal fascicle of the deltoid ligament on hindfoot joint movements: an experimental study. Foot Ankle. 1989 Aug. 10(1):30-5. [Medline]. Kjaersgaard-Andersen P, Wethelund JO, Helmig P, Soballe K. The stabilizing effect of the ligamentous structures in the sinus and canalis tarsi on movements in the hindfoot. An experimental study. Am J Sports Med. 1988 Sep-Oct. 16(5):512-6. [Medline]. Cass JR, Morrey BF, Katoh Y, Chao EY. Ankle instability: comparison of primary repair and delayed reconstruction after long-term follow-up study. Clin Orthop Relat Res. 1985 Sep. (198):110-7. [Medline]. Trouilloud P, Dia A, Grammont P, Gelle MC, Autissier JM. [Variations in the calcaneo-fibular ligament (lig. calcaneofibulare). Application to the kinematics of the ankle] [French]. Bull Assoc Anat (Nancy). 1988 Mar. 72(216):31-5. [Medline].